Tampa International is only about 45 minutes. South West lake & golf views. (washer and dryer) and 2 car automatic garage. High grade carpets and tiles have been used throughout. Bathroom with seperate WC & walk in shower room. I thoroughly enjoyed my vacation in this lovely villa. The Villa was very clean and had everything needed for a comfortable stay. Good location too. I would recommend this rental and would certainly use again. The owners were extremely nice to do business with as well. Many thanks Linda .... we look forward to welcoming you again soon. 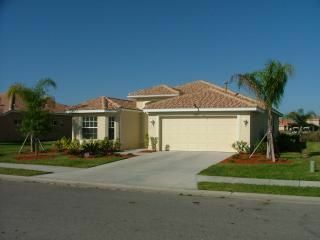 We have stayed on Heritage Harbour Bradenton many times but this was our first time in this villa. It was excellent, just as shown on the web site. The free internet was a bonus and my husband was impressed with the sports coverage when he wasnt playing golf. The villa was clean and really well maintained, there was plenty of local information from both the owners and other guests. Reading the guests comments it would appear that many are repeat guests. We enjoyed it so much last year and have booked again for this year, We found that the owners were helpful and even pencilled us in while we were waiting for the flights to become available for this year. Indeed, we do enjoy a high number of repeat guests (29 weeks in 2010) which we take great pride in and will be as flexible and helpful as we can. The property was absolutely beautiful. It was clean and very well maintained. close to many attractions and also close to great shopping outlets. We attach great importance to making sure everything is as right as it can be with the home. We have been visiting this area now for 9 years and just love it ! area offering high standards at great value. Its golfers paradise ! playing and has plenty of wildlife to look at if all else fails ! mature 'Preserve' landscape, lakes and ponds. reviews. No surprises.... plenty of water! the road with open fairways but plenty of water / out of bounds. unforgettable holes carved alongside the scenic Manatee River. restaurants within easy driving distance at St Armands Circle.